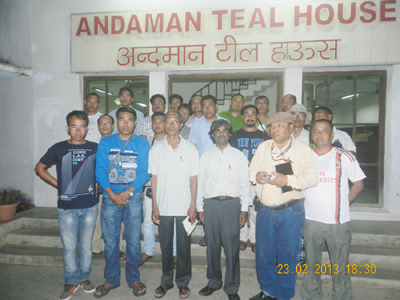 Port Blair, Feb. 24: A group of journalists from Manipur who are currently on a visit to A&N Islands interacted with the local journalists on 23rd Feb. 2013 at Andaman Teal House, which was arranged by the local PIB office. The visiting journalists are here to press on the demand to have a memorial at Mt. Harriet, where one of their King’s was sent as a political prisoner and was later killed under the British regime. The group of journalists also called upon the Chief Secretary yesterday and apprised him of the demand of Manipuri community to have a memorial. They also laid a request to have a Manipur guest house in Port Blair for the convenience of the Manipuri community who would be visiting to pay tributes the martyr King.